KD Fasteners, Inc.’s 316 Stainless Steel heavy hex nuts are a thicker hex nut that are compatible with 316 Stainless Steel heavy hex bolts. This duo is well suited to harsh environments. 316 stainless steel contains more nickel than 304 stainless steel and molybdenum has been added with the following resulting properties. 316 stainless steel can also withstand harsh environments while being exposed to fresh water and sea water, chloride corrosion and other chemicals such as sulfuric, phosphoric and acetic acids. These results give 316 stainless steel better corrosion resistance than 300 series stainless steel. 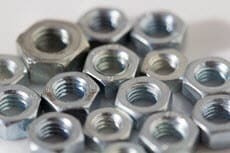 316 Stainless Steel hex nuts are available in standard (inch) and metric sizing and are made in the United States. Off-the-shelf sizes range from ¼ inch to 3-inch diameter. Whether you need a standard or custom size, KD Fasteners has a solution for you. Contact us today by calling 1-800-736-5014 or filling out our contact form.